I do not have much time but I was so excited this evening to find out that Matt Hammitt finally released his single "All of Me". Matt Hammitt's third little boy Bowen, was born with life threatening heart problems in September of this year. He wrote this song about his journey and first released his work tape of "All Of Me" in this blog post. I listened to the song and cried huge crocodile tears. I felt like he wrote this song about my life. It spoke to my heart like no other song has ever spoken to me. It was all about the last 4 years of our journey. It spoke to the fear I had around raising Makenzie long term and the potential of loosing her. It spoke about the intense love I have for her and also about the days when I felt like my love was not enough. It spoke to all of the pain and the sadness stealing precious time I had to spend just loving my girl. It acknowledged my broken heart. This song also reminded me that God was in each and every one of the moments I have ever had with any of my children. It reminded me that Heaven did bring me to this moment. Makenzie is worth every fallen tear. She is worth all of the pain. Her life has forced me to face many of my fears. Her life has been and is worth every second of it! Wreckless love! You can listen to the full song in this post or buy the single here on iTunes! This weekend we decided to get crafty. Years ago our kitchen table used to be beautiful and then my kids happened. When we started talking about moving, I started talking about painting my table set black. I have never done such a thing and am about as far away from crafty as you can get so it never happened. On Sunday however after we went to church we all sat around the living room looking at each other without much of anything to do. Jokingly I mentioned going to Lowes to get spray paint so we could paint the table and my joke quickly turned into reality. So off we went. All of the kids and the kidwalk in tow to buy paint. Home improvement stores are some of the best stores to use the walker in. The aisles are wide and the store is huge. Usually there are not to many people around and they have 2 whole isles of ceiling fans and lights for Makenzie to look at! Makenzie loves the Kidwalk. She has a hard time keeping her hips back and her legs apart in this walker so her PT tried some ace wrap around her thighs which did the trick! Makenzie loved Lowes and Lowes loved her shoes. I thought it was so cool when the employee in the paint department came to say Hi to Makenzie. She got down at her level and said hi. Then she told her how cool her shoes where and asked her where she got them from. Makenzie smiled and then tried to run her over! LOL! We got our paint and off we went. By this time I was starting to get a bit nervous and thought maybe I should start doing some table shopping online. I was sure we were going to need a new table and chairs by the time we were done! So we started sanding a few of the surfaces. Then it was time to put on some primer. By the time we were done priming, painting, and putting on clear coat I thought I would be covered in paint forever! The table and chairs look GREAT!!!!! At our old house the kitchen was not big enough for the leaf to be in the table but we have more then enough room for the bigger version here! I think it looks really good. Now I just need to decide what kind of decor I want to put in this room. Choices, choices. I think I will wait for IKEA to open before I decide. I can't wait!!! A lot has gone on this week. Even though we were super busy it was a good week that felt a bit more normal. As much as I love all of the help we have received it was nice not to have nail guns firing, power saws running, and people in and out all day. The house is looking good. Slowly but surely we have figured out were everything is and today thanks to my mom some pictures even found their way onto the walls. Feels good! Makenzie and I headed downtown for another appointment to work on the power wheelchair. Her seating guy came bearing gifts of grand proportion. Makenzie (within the week....crossing my fingers) will be getting a power chair delivered to our home (the one we modified for this very reason) for her to trial. There are several things Makenzie needs to show us she can do in a power chair before we can order one but the only way to learn these things is to practice! So practice we will and in about a month we will return to the seating clinic to show off Makenzie's new skills and hopefully be ready to order one of her very own! I am beyond grateful for Makenzie's team! Not one time has my little girl gone without the equipment which helps makes her life so much better. There are not enough ways to say thank you to all of these amazing people! This week Makenzie also got to try out a walker she has used before with little to no success, the Kidwalk. Six months ago all she did in the Kidwalk was flex and cry. This week she took off. Healing... oh blessed healing! She loved every second! This walker gives her much better positioning and also allows for more weight bearing. It is a much harder walker to propel but Makenzie seemed to know just what to do. She even was able to push her self UP a small incline! SO the list of equipment grows. I thought once we got Makenzie's wheelchair in December we would have been done for a while but I was wrong. The list of "stuff" we need to get ordered seems to be lever ending and is really quite long at the moment. Here is the list as of right now.......1. Power chair 2. special needs car seat 3. bath chair that can be converted to a shower chair once the bathroom is remodeled and 4. Kidwalk. I am now off to watch a movie with the kids and then fall into bed! This morning at church the sermon was on rest. This word is not a word that is terribly familiar to me but it was so nice to be reminded that rest is ok and even something God demands. So rest we did..... well kind of...... ok not really. We stopped at Sam's Club to pick up a few things for the house. The boy's beloved trampoline has seen better days and needed to be replaced. I swore for years that I would NEVER do the trampoline thing but when my parents brought one over that was given to then by a neighbor that was moving so I reluctantly set it up. That stinking tramp has been the best source of entertainment for the last 3 years. When I told the boys why we were heading to Sam's their faces lite up and the thanks yous started flowing. So for the most part of this afternoon we spent outside putting up the new trampoline. It was a beautiful day. I pushed Makenzie down the ramp off the back deck and into the yard. She loves to be outside. She sat and supervised, making sure the boys were following the directions! Between Mr 12, Mr 10, and Miss 10 they got most of the frame up all by themselves. Once the frame was together we counted the wholes in the frame and the little triangles on the mat over and over. We had to break it into 4ths to make sure we got the tension right and everything lines up. I think we started over about 5 times before we had it right. Frustrating but we did it! By this time Mr 10 and Miss 10 had become bored so they decided it was time to have a snack and get a bit silly. About the same time Makenzie was done hanging out in her chair so I brought out a blanket and laid her out in the shade on the grass. She kicked and rolled off the blanket more times then I can count. She was so content just to be outside and part of everything that was going on. I am not sure how long it took us but when it was finally done we had to try it out! Makenzie laughed so hard while watching all of the kids jump. Tomorrow she will get her turn to play because by the time we were done, it was dinner, bath, and bed time for my princess. So I guess by definition we did not rest today but man we sure did have a ton of fun! I have been a parent now for over 13 years. Crazy! For thirteen years I have washed my families clothes either at a laundry mat or in a hand me down washer and dryer. For thirteen years I have been thankful to have clothes to wash and some way to wash them. When we moved part of the washer was broken. We tried to fix it. No can do. There was an extra washer that was left here so we hooked it up ran it through a couple of cycles to make sure it worked and then threw a load of laundry in. It filled, it ran through the cycle, and it drained. No spin. Soaking wet clothes. Three hours in the dryer. Not gonna work. I went to several stores and looked at many machines. I found a super good deal on these and I could not be happier. It is amazing how much easier a job can be when you have the right equipment. Washing clothes for anywhere between five to nine people can be an undertaking. Doing it with a drier that takes at least 2 hours to dry one load kept me at least 4 loads behind at all times. These machines seriously think for themselves and the dryer even senses how wet the clothes are. I have yet to go to switch out the laundry only to find wet clothes that need to be run again! I can wash a whole day worth of clothes for nine people in one load including any blankets Makenzie may have soiled the night before. Tonight every single piece of laundry in my house is clean and it wasn't an all day affair. In fact it has all been clean since Weds.! AMAZING! It really is such a huge relief not to have this chore constantly nagging for my attention. Oh the simple things in life! I has been an amazing week. Slowly but surely we are all settling in. Many of the little things that need to be done are getting done around the house and I am figuring out where everything has been placed. The boys have settled in and are loving their huge backyard that happens to be a park. They have found a tree to climb, balls to throw as far as their little arms will let them, and of course they can run until their little legs give out. It has been GREAT! The best part about it is someone else get to water and groom the vast majority of our huge back yard. Makenzie has enjoyed hanging out on the back deck watching dogs catch balls, baseball, and soccer games, and even a few kites. It has been quite rainy but we have made good use of the time it has been sunny to be outside on the deck. In speech on Monday Makenzie's therapist set up a choice on her talker to tell about her new house. Makenzie picked it several times and giggled and got so silly every time she would choose that button. Later that day I asked Makenzie if she liked her new house and she smiled so big and babbled all while almost throwing herself out of my lap. I then asked her if she wanted to go back to the old house and immediately she got really quiet and the smile quickly slipped from her face. So smart she is! As I briefly mentioned in my last post, we have a contract on our old home. We have a long way to go on the process to close the deal and I would like to ask everyone to pray that it goes smoothly. I am most concerned about an issues that could come up with the inspection. We are already upside down on the deal and any major issues could kill the deal completely. Please pray. 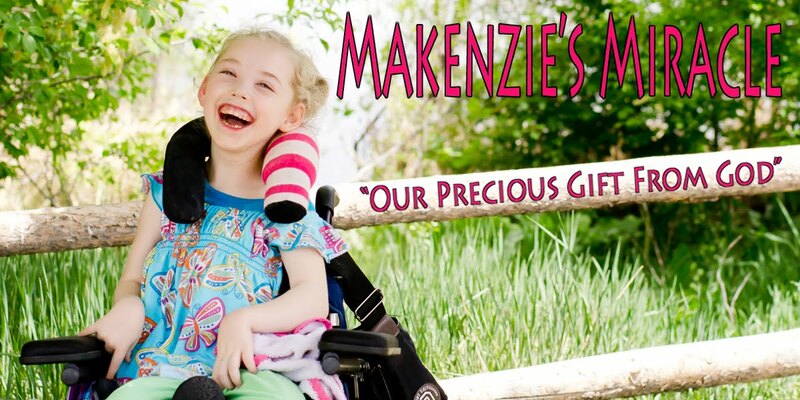 This afternoon Makenzie and I will be heading back to Aspen Seating to have her wheelchair adjusted because she has grown so much in the last six months! Her therapist will be meeting us there to make sure that all of Makenzie's needs will be meet when it comes to any new positioning needs and to address some issue we are still having with anchoring her hips. It is now time for our morning drive to the school! Have a great day! I wrote a Mother's Day Post..... never finished it. I have sat down about five times in the 2 days to write about our move...... never finished it. I hope I can get this post finished before I have to take the kids to school! God is good and we are moved! In the last three weeks with the help of our community, family, friends, and complete strangers, we have deep cleaned, moved walls, widened hallways, widened doorways, moved furnace flues, put in an air conditioning unit, done a ton of landscaping, built a walk-in closet, removed old ugly paneling, fixed dry wall, built a ramp off the back deck, re textured, professionally painted the whole house, passed numerous inspections, fixed and turned on the sprinkler system, fixed and added lighting, laid new floors, replaced old vents for new and moved in. To add icing to the cake we are about ninety percent un packed! To add sprinkles to the icing we got an offer on our house yesterday. We had all of our belongings packed up on Wed. night and started moving on Thursday morning after Makenzie had PT. It was an absolutely perfect move and the out pouring of help we received leaves me speechless! We moved in on top of the floors being finished so anything that could not go into the basement ended up in the garage on Thursday afternoon. They finished the floors about 6 pm and we were able to get the beds into the rooms upstairs and avoided staying at a hotel. I packed a suitcase with three days worth of clothes and medical supplies and didn't let that bag out of my sight! It worked because I had what I needed and there was no frustration over not being able to find anything. Watching TV and eating pizza while we unloaded the truck. Now that my house looks like a home I am feeling very overwhelmed with emotion. We have already made so many memories here. We had a BBQ. We have hung out on the deck with friends after the kids were in bed with drinks and much laughter. We got a gate up in front of the stairs and Makenzie was able to walk all over the house...... literally. She came and found me in my room. She was so proud and I cried! She chased Morgan around in his walker and was in the middle of all the action, loving every moment! While moving was a lot of work and I would be lying if I told you I didn't get frustrated, tired, and crabby, it was all so very worth it! This house is PERFECT! This is a home that we can live in FOREVER! This is a house that provides every member of this family exactly what they need. I LOVE IT and have yet to miss "home"! If you prayed for this move, if you helped with this move, if you contributed financially to the remodel of this move THANK YOU, THANK YOU, THANK YOU!!!!! I will post pictures soon. For now though I must head of to get the kids to school!!! I have not done the photo challenge at iheartfaces for a few weeks but I could not resist submitting this picture I took yesterday! You can check out other entries here!